Those beautiful LED headlights you see on luxury cars look amazing, but there’s another reason they’re so great: safety. LED headlamps project light further, allowing you to see things much sooner while driving at night than you would with halogen bulbs. And as we all know, just a few extra milliseconds of visibility can mean the difference between a near miss and a brutal collision. What you might not know, however, is that you don’t need a $70,000 luxury car to get those awesome LED bulbs. 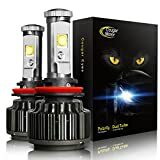 The CougarMotor LED Headlight Bulbs All-in-One Conversion Kit comes in 10 different sizes, making it compatible with any car on the road. Worried about a complex installation? Think again — just about anyone can install these stunning headlights in about 15 or 20 minutes, tops. Definitely check them out.